The St. Matthew’s lot at Delaware Avenue and M Street will become a Christmas tree lot again this year, but with a twist. In anticipation of finally starting construction sometime during the second quarter of 2015 on a new sanctuary and a 200-unit apartment building and as a thank you to the community for its patience over the years, St. Matthew’s will be giving away trees on Saturday, December 13. From 10am to 1pm, trees will be given to previous customers. In order to receive a tree, customers need to send an email to stmatthewsdc@hughes.net by noon on December 11 to receive a verification email with an identifying number. After 1pm, the remaining trees will be given to the community at-large. Those who have not purchased a tree in the past and would like one of the remaining trees in the giveaway will need to pick up a reservation number sometime between 10am and 1pm on the 13th. Free food and beverages will be provided during the giveaway, as well as a free Christmas CD while supplies last. Akridge has conceded to build a portion of the Reeves Center site without residential uses according to The Washington Post. 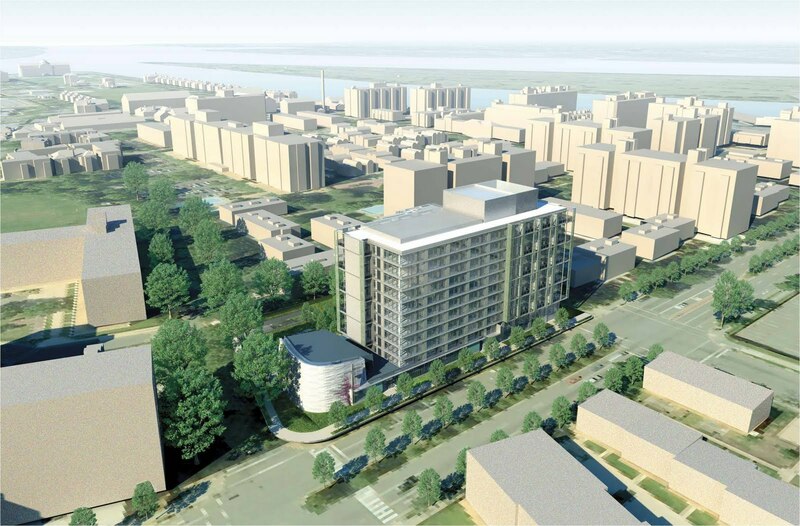 Housing Complex writes about the "inevitability" of Buzzard Point. An article in Housing Complex states that DC United doesn't need a tax abatement in order to build the soccer stadium according to testimony by the CFO. Capital Business reports that the Reeves Center swap may be removed from the deal. In addition, a Community Benefits Agreement (CBA) for the area near the proposed Buzzard Point stadium site may still be on the table. The consultant report acknowledges in the potential risks section that the District usually provides a significant CBA in these kinds of deals and will need to be factored in the $150 million cap on expenses. Ward 8 Council member Marion Barry is quoted in the Capital Business article as saying: "no stadium deal will be done without a Community Benefits Agreement." Mayor-Elect Bowser has stated she will remove the Reeves Center swap from the stadium deal in remarks to the Federal City Council according to reporting by The Washington Post. The DC Fiscal Policy Institute has some ideas on how to improve the stadium deal. Two DC Council committees will vote on the stadium legislation on November 25 according to Capital Business sans Reeves Center swap. 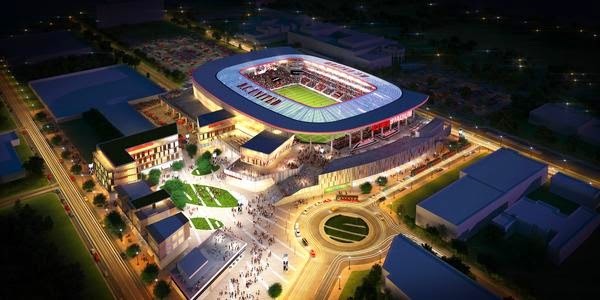 Both committees in the DC Council approved legislstion to buikd a soccer stadium for DC United according to The Washington Post. Within the past week or so, demolition was completed at St. Augustine's Church located at 6th Street and Maine Avenue, which will be replaced with a new sanctuary and 108 mixed-income condos. A sheeting and shoring permit has been obtained and excavation is scheduled to begin by mid-December. Waterfront Park will begin construction next May and will be completed the following April, around the same time the adjacent church and condo building will be finished. 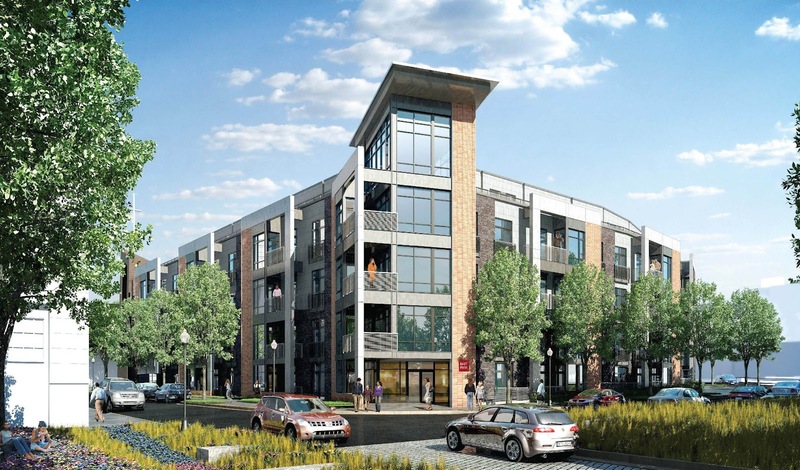 Meanwhile, office leasing has begun for the two office buildings planned in the first phase of development at The Wharf totaling 485,000 square feet on parcels 1 and 3a. 800 Maine Avenue (parcel 3a) will be 220,000 square and 1000 Maine Avenue (parcel 1) will be 265,000 square feet. 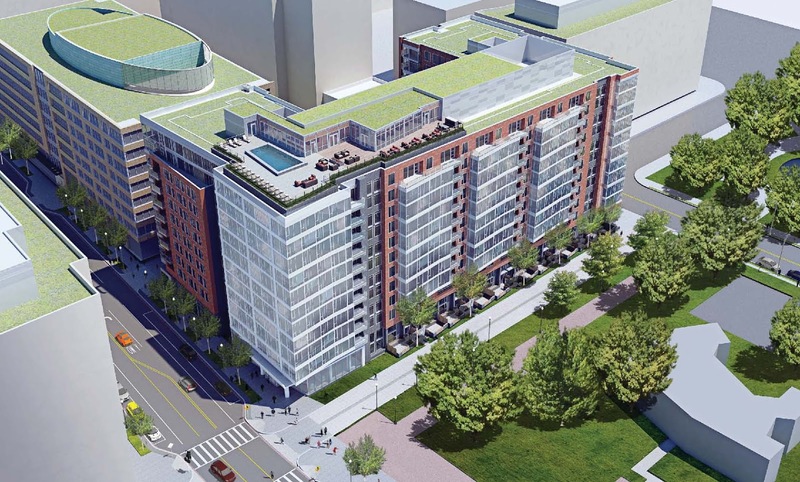 An added amenity for tenants of 800 Maine Avenue will be access to the Wharf Club, containing a 7,000 SF fitness center, meeting space, an infinity pool, and a one-acre park above the planned Wharf Center concert venue, overlooking the Washington Channel. Both builings will be completed in the third quarter of 2017 and are anticipated to achieve LEED-Gold certification. One of the public plazas at The Wharf will be named after DC Delegate Eleanor Holmes Norton, who was responsible for coming up with the name "The Wharf" and whose great-grandfather escaped slavery in Virginia and came to Southwest in the 1850s. 20 restaurants will open in the first phase of development. Among the planned businesses to open will be a rum distillery. Letters of intent have been signed for two-thirds of the planned retail space in phase one. The Maine Avenue Fish Market will be enhanced with the addition of pincic tables, transient docks for day-trippers, and fruit & vegetable vendors. International Spy Museum to L'Enfant Plaza? The Malrite Co., owner of the museum, has signed a lease yet but is focused on trying to work out a deal there, according to company spokesman Jason Werden. Between 600,000 and 700,000 people visit the Spy Museum annually, which would bring additional traffic to L'Enfant Plaza and help to transform the complex away from a primarily 9 to 5 office environment. Earlier this year, the JBG Companies completed the second phase of renovations to the retail portion of the complex, while the east office building was recently renovated and the north office building's revamp will soon be complete. In addition, the L'Enfant Plaza Hotel (owned by an affiliate of Sanford Hotel Group) is cuurently under renovation and will reopen in 2016. This is not the first museum to consider moving to the office-heavy mixed-use complex. Before being lured away to National Harbor, the National Children's Museum was moving to L'Enfant Plaza in a new building that would be constructed in the middle of the plaza. Ironically, the Children's Museum is now also looking for new space in the District after being open at National Harbor for only two years per the WBJ. Pepco will be holding a community meeting this evening to discuss the proposed Waterfront subststion the utility wants to build on Buzzard Point. It wants to replace the existing substation at First and T streets with a new facility at First and R streets to accommodate growth in the Capitol Riverfront and Southwest Waterfront neighborhoods. The meeting will be held from 6-8pm at King-Greenleaf Recreation Center (201 N St). Council Chairman Phil Mendelson will hold a public hearing tomorrow evening to discuss the legislation surrounding the proposed DC United stadium on Buzzard Point. The hearing will be held at the Wilson Building downtown starting at 6pm. It is likely that the Council will vote on the stadium next week soon, so at Monday's ANC 6D meeting, the Commissioners voted unanimously to urge the Council to delay their vote until the next Council session begins in early 2015 in order to fully address unresolved issues with the bill. Within the next month, construction fencing will be put up around the northwest parcel of Waterfront Station where Waterfront Associates plans a 365-unit, 11-story multifamily rental building with ground floor retail. This will be the third of four residential buildings to be developed at Waterfront Station after the two Sky House apartment buildings. The second stage PUD was approved back in September 2013. It will take about 22 months to build with construction completion estimated in September 2016. Over at Sky House West, the finishing touches are being put into place in the large outdoor terrace between the apartment building and 1101 4th Street, including landscaping, seating, and an indoor/outdoor fireplace. A peek inside the building reveals that the fitness center equipment is mostly installed while work continues on some of the first floor units. In other Waterfront Station news, the owners of the retail space on 4th Street are in discussions with a potential tenant for the vacant 1,200 SF space at 1100 4th Street – a car rental group that could potentially open in 2015. Meanwhile, the larger 4,130 SF space next to Station 4 at 1101 4th Street is being eyed as a bank or potentially a hardware store. On a related note, an article in this weekend's Washington Post brought into question whether the stadium deal needs to be reworked because of some of the unresolved issues also addressed in ANC 6D's resolution. The proposed stadium cost of $286.7 million (including a roughly 46/54 split between the city and DC United) would be the most expensive MLS stadium built to-date, which compares to the average stadium cost of $160 million (adjusted for inflation and location). The report states that the higher costs for the Buzzard Point stadium are driven primarily by higher land acquisition, remediation, and horizontal development costs, and quality of stadium construction. The District’s contribution could increase from $131.1 million to the $150 million cap due to environmental remediation, or other cost overruns. However, there are no cost caps on cleanup of the Pepco or Akridge parcels – for instance, the District is responsible for relocating Pepco’s turbines and high voltage power lines, which can significantly increase the cost of remediation. The public/private partnership cost split is consistent with the average MLS soccer-specific stadium, although the total dollar amount contributed by each entity is one the highest among MLS-specific stadiums, due in part to the high relative cost of the stadium itself. The Buzzard Point parcels have been overvalued by $19.4 million and the Reeves Center has been undervalued by $11.2 million, resulting in an overpayment by the District of $25.7 million (after a contribution committed by DC United and Akridge). As a result of the stadium, the Net Present Value (NPV) of new direct, indirect, and induced spending created in the city is estimated to be $2.6 billion over the next 31 years, which is estimated to support 1,683 new full-time equivalent jobs, generating personal earnings of $1.3 billion over the same time period. This includes activity at the stadium, the new hotel adjacent to the stadium, the redevelopment of the Reeves Center, and a new municipal center in Anacostia. Without the stadium, no significant development on Buzzard Point is anticipated for eight to 10 years at a minimum. If the Stadium Act is approved, the report estimates that between 300,000 and 700,000 square feet of development will occur within the next five to seven years near the stadium – mostly residential with some ground floor retail. The area is not as transit-friendly as the rest of Capitol Riverfront and Southwest and will need significant infrastructure improvements in order to generate developer interest. Operating income at the stadium would begin to be profitable at year six of operations (2022). Tax abatements provided to the team equal a NVP of $50 million, with $43 million in property tax abatements and $7 million in sales tax abatements. 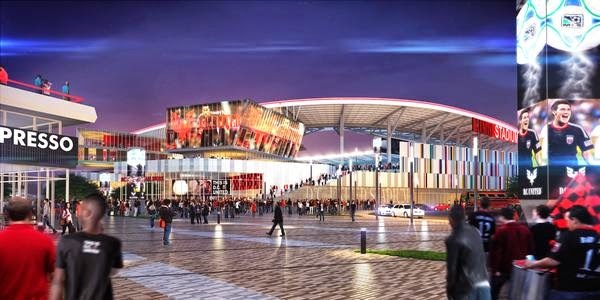 The fiscal benefits and land proceeds from the stadium deal will have a NPV of $365.2 million, minus the total costs of $255.9 million, results in a net benefit to the District (depending on whether the city makes a $131.1 million or $150 million contribution to the stadium) of anywhere between $89 - $109.4 million. Annual paid attendance of 561,000 people for 36 events is estimated for the stadium, which compares to between 2.5 million and 3 million annual visitors to Nationals Park for 81 home games plus the playoffs and additional events. The stadium has been designed to have 24 suites with 20 seats each for a total of 480 suite seats out of 20,000 total seats. Ticket prices are anticipated to range from $20 to $28 per game, depending on the match. In addition, the average club seat and suite ticket prices are estimated to be $50 per game, excluding premiums. Construction is anticipated to begin in November 2015 and conclude in 2017. The planned $45 million, 200-key hotel adjacent to the stadium would likely not start construction until 2020. 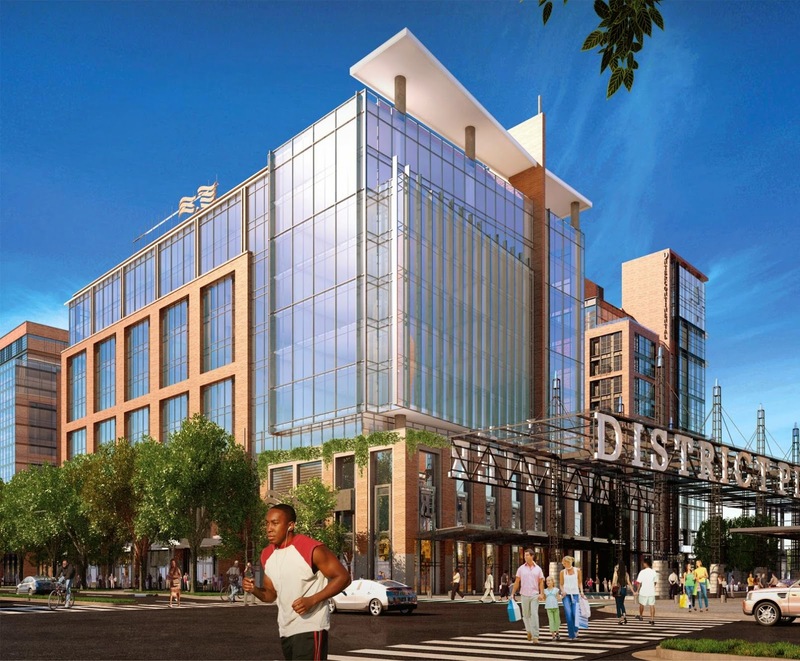 Pepco submitted its application to the Board of Zoning Adjustment last month in order to build a new distribution substation across the street from the proposed DC United stadium site at 2nd and R streets on Buzzard Point. 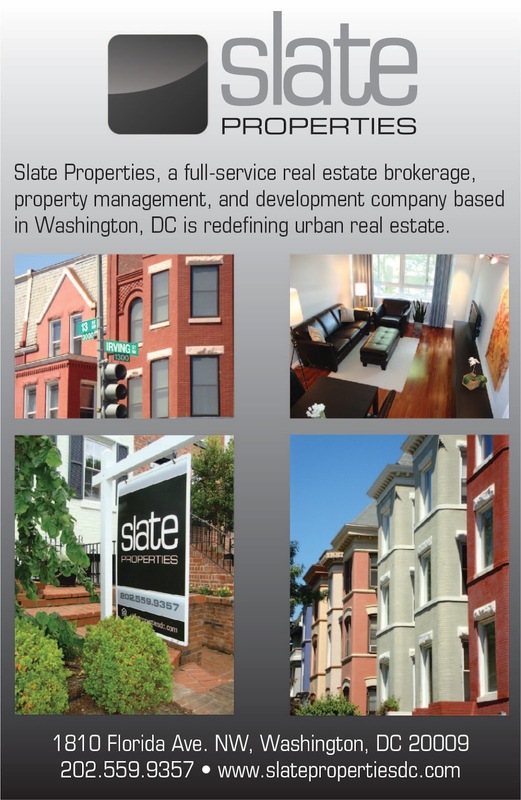 The substation is needed in order to accommodate growth in Southwest and Near SE/Navy Yard/Capitol Riverfront. According to the application, the proposed Waterfront Substation will consist of a two-story plus cellar building with approximately 57,751 square feet of gross floor area and approximately 33,022 square feet of cellar floor area. The building will have a maximum height of 59 feet and six parking spaces will be located on the western side of the site with loading facilities on Q Street. View of substation from the corner of 2nd and R streets. The design of the substation by CORE Architects will include an open court on Q Street and a landscaped plaza on R Street; the building will be set back from the property line. In addition, the façade will have vegetated screens with “creeping vines” and an art installation on the corner of First and R streets. Adjacent to the proposed substation is the historic Dent House at the corner of First and Q streets. Pepco also owns the house, but will not incorporate it into the substation. Concerns have been brought up about having a substation in close proximity to homes by neighboring residents, led by ANC 6D Commissioner Rhonda Hamilton whose single-member district includes the proposed substation location. Pepco has stated that they have several substations across the city near homes and any emissions are within safe levels. There will be a public meeting tomorrow evening at Westminster Presbyterian Church (400 I Street) to go over the proposal starting at 6pm. If approved, construction on the substation is expected to begin in 2015 with completion by the end of 2016. Demolition continues apace over at The Wharf development. Phillips Flagship is now gone and the only building left along the waterfront from 7th Street to the Maine Avenue Fish Market is the Capital Yacht Club/Jenny’s Asian Fusion (both establishments have been relocated to the former Channel Inn). Utility work along Maine Avenue should last until sometime in December. Over at 6th and M streets (also known as Parcel 11), demolition began last Thursday at St. Augustine’s Church. Prior to the demolition, the copper beech tree on site was moved to the site of the future Waterfront Park near where the Maine Lobsterman statue used to be located (it has been put in storage and will be reinstalled near the Maine Avenue Fish Market). In the demolished church’s place will be a new St. Augustine’s, as well as 108 mixed-income condo units, which should be complete in 2016. Even more progress has been made on the water side of The Wharf development as crews are months ahead of schedule. New docks and slips have been installed for the Capital Yacht Club to the east of 7th Street and piles are being driven for the massive District Pier that will extend from Maine Avenue at 9th Street out into the Washington Channel. Work on the seawall will also soon be underway. Meanwhile, renovations have been made to the former Channel Inn at 7th and Water streets and will contain several offices, including Perkins Eastman DC, Clark Construction, Capital Yacht Club, Jenny’s, Madison Marquette, E.R. 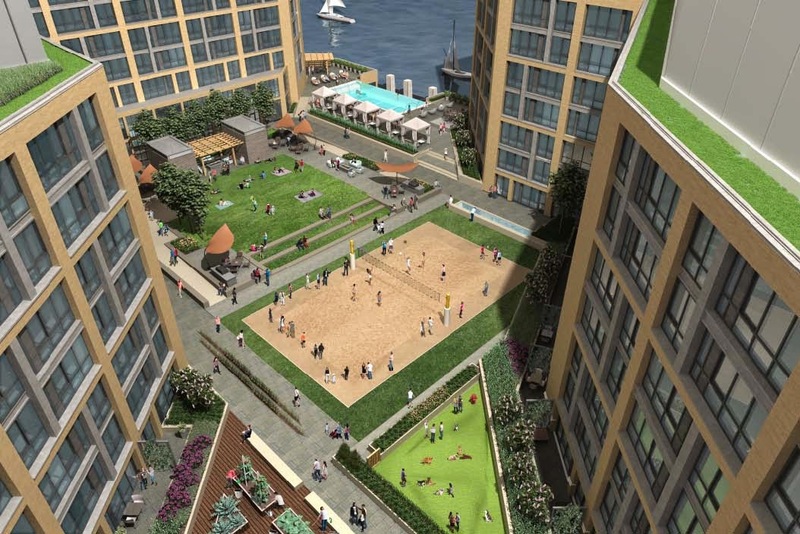 Bacon Development, Hoffman-Madison Waterfront, and PN Hoffman & Associates (PN Hoffman’s corporate headquarters will remain at the Wharf – either at Parcel 3A or at Pier 4). Jenny's may re-open at the Channel Inn by next moth in a cafe format serving breakfast, lunch, and dinner.